Sunbeam Family Services is one of the only organizations in central Oklahoma with a focus on Infant Mental Health specialization. Nationally, between 9.5 and 14 percent of children age birth to five experience social and emotional problems. In Oklahoma 65 percent of infants and young children have at least one risk factor known to impact healthy development. 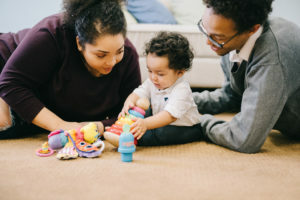 Sunbeam’s Infant Mental Health program offers therapy services by licensed and licensed-eligible therapists to families with infants, very young children and their caregivers prenatally through age 5. Our therapists receive ongoing specialized training and reflective consultation to support them in providing high quality, relationship focused family therapy services. We offer training in the community about infant mental health which includes topics such as child development, attachment, adverse childhood experiences, the impact of trauma on the developing brain and the importance of nurturing relationships in the earliest years to promote and support health and well-being. For more information about Sunbeam’s Infant Mental Health program, contact Sunbeam’s Early Childhood Mental Health Coordinator, Amy Chlouber, LPC-S, 405.609.1958 or email achlouber@sunbeamfamilyservices.org. Infant mental health refers to how well a child develops socially and emotionally from birth to three. Early experiences matter! The brain develops 90% of all the neural connections it will need in life before the age of 6. This means that experiences have a much stronger impact–for good or bad–on infants and young children. Research is clear that infants who have secure relationships are able to explore their world, have positive experiences and grow into healthier, more productive adults. What is the impact of stress and trauma on children? Stress and trauma has a devastating impact on the brain development of an infant or young child and can negatively impact a child’s ability to form secure relationships. Research has shown that infants and toddlers who do not develop secure attachments produce elevated levels of cortisol (stress hormone)., which may alter the developing brain circuits and cause long-term harm. Young children with unhealthy attachments are at much greater risk for delinquency, substance abuse, and depression later in life. Adverse childhood experiences (ACEs) are stressful or traumatic events, including abuse and neglect. They may also include household dysfunction such as witnessing domestic violence or growing up with family members who have substance use disorders. Do babies really need counseling? Sometimes they do. For young children, such as in utero babies, infants, toddler and preschoolers who experience neglect, trauma, lack of nurturance or food, or witness or even hear domestic violence, these experiences shape their brains to mistrust caregivers and wires their stress system to be overresponsive. These changes in the brain make it difficult for children to build a healthy and secure relationship with caregivers–their biggest and most important task of early childhood is hindered. Research is clear that when children can have secure relationships with caregivers early in life, they are more likely to become halthy function adults. What should I expect in sessions with my child? The relationships between a child and their caregiver is the primary focus of treatment at Sunbeam. For the initial session, you will meet with the therapist without your child to explore your concerns. Future sessions will consist of you and your child meeting with the clinician in a therapeutic playroom at Sunbeam or at Educare. Sessions typically last 50 minutes. During this time, you and your child will be able to play together, and at times, the therapist may direct your play. Throughout the session, you and the therapist will partner to explore your child’s needs and cues and develop strategies to support connection between you and your child as a way to support regulation of emotions and behavior and promote well-being. At times, the therapist may ask to schedule caregiver-only sessions so that you and the therapist can explore issues and strategies in more detail. What expertise and training do therapists in the Infant Mental Health Program Have?